For the last six years I have either been either pregnant or nursing. It is good, but it is exhausting. Motherhood is hard, but a blessing. One of my goals for this year is being intentional. Who better to encourage us than Leigh Ann from Intentional by Grace. She is an amazing encourager. Read on. You will be blessed. There are so many things I want to accomplish each day. The task list is ever growing, and most days the minute I check one thing off my list, I need to add ten more to it. I want to be intentional with my time and with my life, but there’s one little hitch in my overall plan. I have two little children who need Mommy all the time. Being a mom is a dream come true for me. It really is. I love being Mommy to my two little boys (ages 4 and 1), and we hope to enjoy more little feet pitter-pattering across the kitchen floor in the months and years to come. However, even though I love being a Mommy, some days it feels like no small feat to just get through the day. Let alone be intentional with my time. Or so it feels that way. I’m slowly learning that living intentionally doesn’t mean you’ll get to do everything you want, nor does it mean you’ll do everything perfectly. Truth be told, even though I’m purposeful about living intentionally, I forget to make dinner, leave clothes in the washing machine for four days straight, and put off making a dentist appointment so long I eventually forget about it altogether. Even though I seek to be intentional every single day, it doesn’t mean I never drop the ball or that my house isn’t ever a wreck. And I’m okay with that because I will always try again tomorrow. 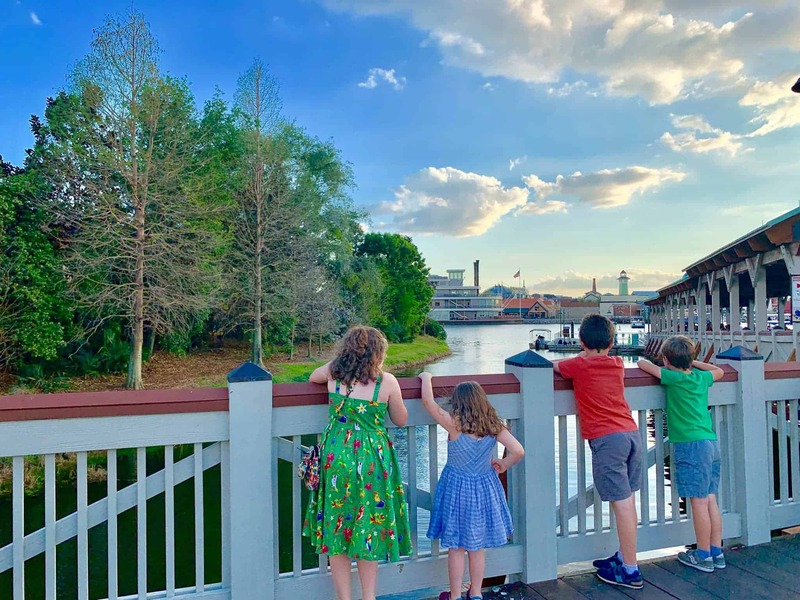 As I seek to be intentional while in the trenches of motherhood, I’ve learned three simple ways I can be intentional that will have the biggest overall impact on not only my life, but the lives of my children as well. If you haven’t stopped to prayerfully determine your God-given purpose, then let the dishes and laundry pile up for a day and take your free moments to develop a mission statement for your life. You were created for a purpose. You have unique gifts and perspective to share with your family and with the world. Creating a mission statement for your life will help you determine your God-given purpose and when the going gets tough, I think you’ll find that your mission statement will encourage you to not give up. As a fellow mom in the trenches, it’s easy to miss the forest for the trees so to speak. When all you do everyday is wipe bottoms, cut food into tiny portions, and clean dried oatmeal off the floor, it’s easy to think that what you do doesn’t matter. But it does. Your mission statement will help you remember why. In order to be intentional while in the trenches of motherhood, you have to get some key areas of your life on auto pilot! Creating habits and rhythms to your day will go a long way in making you more productive (and ultimately more intentional!). I thrive on routines and schedules. Without them, I wonder around aimlessly and motivation flies right out the window. Like a toddler, I like to know what’s coming next, and I like to know that what I’m doing in this moment is the best thing for me (aka, does it align with my God-given mission statement?). Chances are you already have some sort of schedule or rhythm to your day. My family utilizes morning, afternoon, and evening routines that keep our days flowing smoothly (or at least get them back on track when things get chaotic!). Creating routines that I love helps me stay motivated in living intentionally. Take time to scratch out a routine that will help bring peace to your home so you can focus on what I’m going to tell you next. My answer? Just do it. Just BE with your children. Mama, you are not supermom. You do not have to do and be everything. Every need is not your calling and sometimes we need to say no to some really good things in order to say yes to the most important things. I’m not advocating for a kid-centric home because sometimes mama needs to do work on the computer, fold laundry, or take a meal to a friend. However, I am advocating for a re-evaluation of what matters most to you. And I’m giving you permission to say no to some good things in order to be intentional about what matters most to you right now in this season. I’m learning that being patient with my dreams and goals as I pursue God’s will goes a long way in being intentional right now while I’m in the trenches of motherhood. When I started getting really intentional about these three simple things, my life changed. I no longer felt guilty about what I wasn’t getting done. I knew that each day I was doing the best things. Or at least I knew where to go back to when I started feeling chaotic again. The mundane of life was set to routine so it wasn’t such a drag to get it all done each day, and I ended up having more time with my kids! 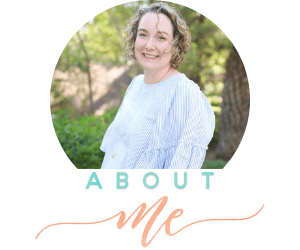 Having a mission statement, being intentional to adhere to our daily routines, and focusing on what matters most to me in this season has helped me to thrive in the trenches of motherhood instead of just survive. I’ve stopped feeling like my life was on hold until my children could wipe their own bottoms. I’ve realized that right now matters. My life matters and being intentional with my time and commitments matters. You are not alone in the trenches, Mama. Sometimes it’s hard to put one foot in front of the other. Sometimes the day-to-day trials of being a mom of little ones can overwhelm us. But always, our lives and how we live them is a chance to bring glory to God as we seek to live for Him in all we do. What about you? 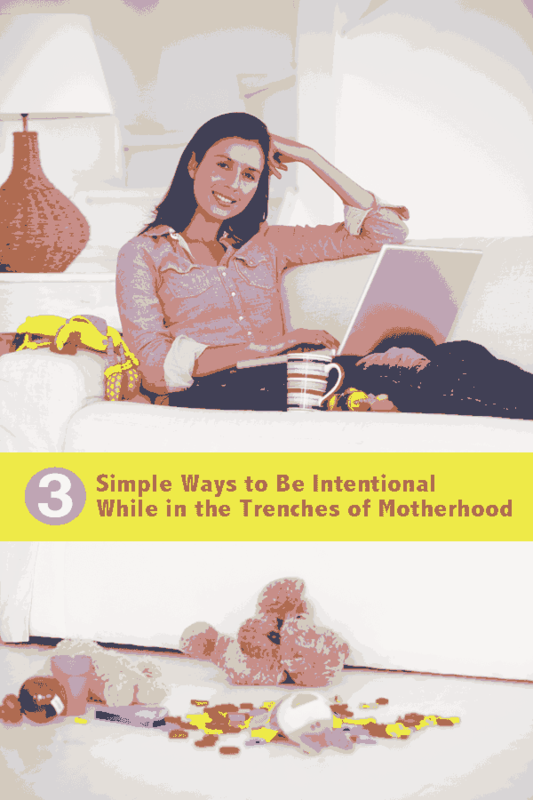 How to seek to be intentional while in the trenches of motherhood? Thanks so much for having me as a guest today, Whitney! Your blog always blesses me! I love the idea of having a mission statement. That seems like a great way to be sure we try better to be intentional. I also think that once we set our mind to doing better, making changes, and learning from our mistakes we become more engaged in our children and naturally parent more intentionally. Great post!